قاب‌های میان‌پر باعث افزایش چشمگیر سختی، مقاومت و همچنین تغییر در شکل‌پذیری سازه نسبت به سازه بدون میانقاب می شوند. در نتیجه موجب تغییر در پاسخ لرزه‌ای اینگونه سازه ها می‌شوند. با این وجود هنوز در کشور ما عملاً توجه چندانی به تأثیر میانقاب‌ها بر روی رفتار لرزه‌ای سازه ها نمی‌شود و معمولا سازه ها بدون در نظر گرفتن اثرات میانقاب‌ها بر رفتار لرزه‌ای آن ها طراحی می‌شوند. دلیل این امر را می‌توان نبود ضوابط آئین نامه‌ای لازم و همچنین عدم شناخت اکثر مهندسین از نحوه اثرگذاری مزبور دانست. در این تحقیق برای ارزیابی دقیق رفتار ساختمآن های با قاب بتنی و میانقاب بنایی به بررسی اثر ضخامت میانقاب (با مدلسازی پنج تیپ نمونه با ضخامت بین 200 تا 310 میلیمتر)، تعداد دهانه و طبقات دارای میانقاب (با مدلسازی هفت تیپ نمونه مختلف) بر میزان سختی اولیه، مقاومت نهایی دیوار، مود خرابی، تنش‌های حداکثر در دیوار و زمان تناوب پرداخته شده است. نتایج این مدل‌ها با یکدیگر مقایسه شده و بصورت جداول و نمودارهایی نشان داده شده است. در مقایسه مدل‌ها با یکدیگر ملاحظه می‌گردد که درسازه‌های دارای میانقاب پریودکاهش یافته است. بنابراین سازه‌های دارای میانقاب دارای سختی بیشتری نسبت به سازه بدون میانقاب هستند. بعلاوه با افزایش ضخامت، اندکی مقاومت سازه و ظرفیت باربری سازه افزایش می‌یابد. Infilled frames significantly increase the stiffness, strength, and also change in ductility of structures compared to non-infill structures. Therefore, they cause changes in the seismic response of these structures. However, in our country, not enough attention is paid to the effect of infill on the seismic behavior of structures yet. So, structures are usually designed without considering the effects of infill on their seismic behavior. The reason could be the absence of the required procedural rules and also a lack of knowledge about the mentioned effect. In this study, for conducting a detailed assessment of the behavior of buildings with concrete frame and masonry infill, we studied the effect of infill thickness (by modeling of five types of samples with thicknesses of 200 to 310 mm), the number of spans and floors (by modeling of seven types of different samples) on the amount of initial stiffness, ultimate strength of the wall, mode of failure, and the maximum stresses in the wall. The results of these models are compared and shown in the tables and graphs. These comparisons show that the period is reduced to structures with infill. Therefore, structures with infill have a higher stiffness compared to non-infill structures. Moreover, by increasing the thickness, the strength and the bearing capacity of the structure will slightly increase. مقدم، حسن، (1373)، طرح لرزه‌ای ساختمان­های آجری، انتشارات دانشگاه صنعتی شریف. 1.Matin M. (2009). Lateral Stiffness of Brick Masonry Infilled Plane Frames. Journal of Structure Engineering, ASCE, 129(8): 1071-1079. 2.Lourenco P.B. (1996). Computational Strategies for Masonry Structures Ph.D.thesis.Delft, The Nether Lands: Delft University of Technology. 3.Ghosh A.K, Made A.M. (2002). Finite Element Analysis of Infilled Frames. Journal of Structural Engineering, ASCE, 128(7): 881-889. 4.Polyakov S.V. (1956). Masonry in Framed Buildings. Translated by G. L. Cairns in 1963, National Lending Library for Science and Technology, Boston Spa, Yorkshire, U.K.
5.Smith B.S. (1962). Lateral Stiffness of Infilled Frames. Journal of the Structural Division, ASCE, 88(6): 183-199. 6.Mehrabi A.B, Shing P.B, Schuller M.P, Noland J.L. (1996). Experimental Evaluation of Masonry-Infilled RC Frames. Journal of Structural Engineering, ASCE, 122(3):228-237. 7.Kappos A.J, Ellul F. (2000). Seismic Design and Performance Assessment of Masonry Infilled R/C Frames. Proceedings of the 12th World Conference on Earthquake Engineering, 0989 on CD-ROM, New Zealand. 8.Giordano A, Mele E, De Luca A.(2002). Modeling of Historical Masonry Structures Comparison of Different Approaches Through a Case Study. Engineering Structures, 24: 1057-1069. 9. Moghaddam H.A. (2004). Lateral Load Behavior of Masonry Infilled Steel Frames with Repair and Retrofit. Journal of Structure Engineering, ASCE, 130(1): 56-63. 11. آزادبخت، محسن، برقی، مصطفی، (1387)، بررسیاثرمیانقابمصالحبناییبرپاسخلرزه‌اییکقاببتنمسلحچهارطبقه، چهاردهمینکنفرانسدانشجویانعمرانکشور،دانشگاهسمنان. 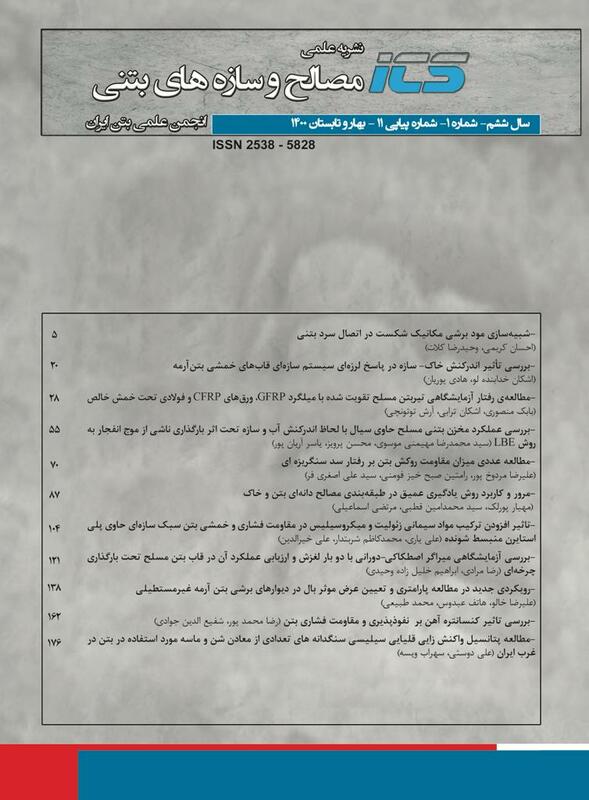 12.Foroughi M, Barkhordari M.A, Aqaee S.M. (2010). Investigation of the Seismic Behavior of Masonry Infilled Frames. Proceedings of the Tenth International Conference on Computational Structures Technology, Civil-Comp Press, Stirlingshire, UK, Paper 350, doi:10.4203/ccp.93.350. 13.Koutromanos I, Stavridis A, Shing P.B, Willam K. (2011). Numerical Modeling of Masonry Infilled RC Frames Subjected to Seismic Loads. Computers and Structures, 89: 1026–1037. 14.آیین نامه طراحی ساختمان­ها در برابر زلزله، استاندارد 2800، ویرایش سوم، مرکز تحقیقات ساختمان و مسکن.